Can The Suzuki Jimny Fit A Pram? 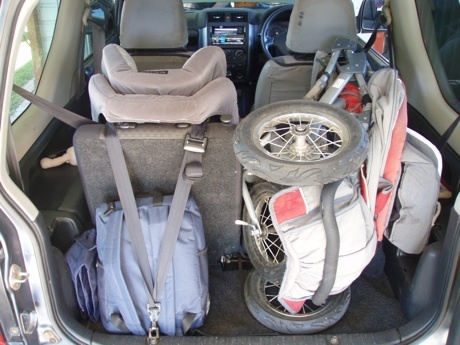 Does The Pram Fit In The Jimny? 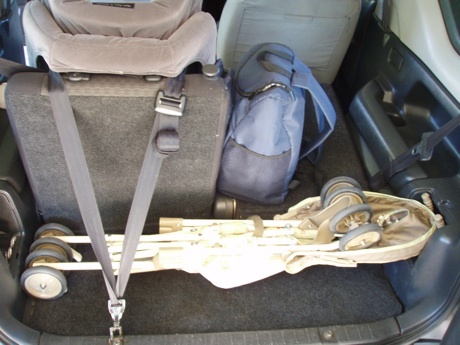 The pram below is a Beema Swallow and as you can see it takes up the whole width of the second back passenger seat, once the seat is folded down. It also spans the entire length from the rear door to almost the driver's seat (full grown adult position). This length is approximately 93cm. The stroller pictured below is just a cheap and light Walmart stroller with pictures of Winnie the Pooh etc on it. Notice that the umbrella handles fit nicely into a recess behind the passenger seats. What About A Box Of Nappies? And Humans? What About Humans? Bek is 160cm tall, Nige is about 5 foot 8. One time, before children, Nige and 4 of his friends (all over 6 foot tall) managed to fit in the car driving from the main street of Broome to the airport (a few kilometres). The three in the back were seated so the third guy had to sit on a leg of each of the other two, and his head had to pitch forward to between the front passenger and driver (aaand please read the disclaimer). The front passenger was so far forward that he accidentally closed the door on his leg. A very short, uncomfortable ride. So What Is the Stowage Capacity? Well, the rear storage can fit anything that is approximately 25cm deep x 95cm wide x 52cm high, if you only have a child in a booster seat and you still want full view of the rear window. 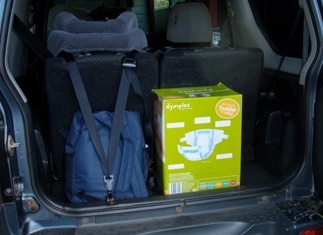 That is, an infant car seat will reduce the rear space due to the rear anchor belt, and 52cm is the approximate vertical height from the rear stowage floor to the top of the rear seat (not the headrest). 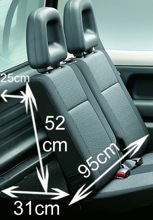 The 25cm limit is due to the plastic bulges on the inside of the rear door and the angle of the rear seats. Obviously, the Jimny is a small 4WD! So what did we do to go camping? We got a camper trailer.